From Portland take Highway 99 through Newberg to Highway 18, then west 60 miles past Willamina to New Grand Ronde. Turn north on Grand Ronde Road to "A" Ackerson Road. Turn left and continue one block, keeping left at the "Y" into the yard of the white house. Be sure to request permission at the house before proceeding past the barn to the bridge. Built in 1932 by Doc Fourtner and his wife, the bridge allowed dairy livestock to cross the South Yamhill River without danger of being swept away by high water. Fourtner demonstrated his skill as a craftsman by cutting trees for the chords, "chalking the lines," and forming the logs into 12" x 12" timbers using an adze and broadax. Lydia Fourtner recalled that she handed boards and tools to her husband during construction of the bridge. 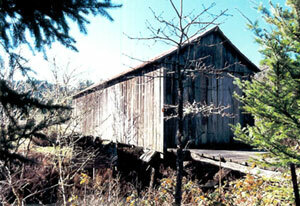 They worked side by side on the farm, and together split shakes for the bridge roof. They adhered to a maintenance schedule that kept the bridge "tuned" and in good repair. A sheet metal roof was added in later years as part of ongoing maintenance. The overall condition of the bridge appears to be relatively good. The 2" x 12" planking is unpainted, adding a rustic charm to the structure. The west end of the bridge is enclosed by a doorway allowing pedestrian access. In past years, visitors frequented the site for fishing and swimming holes, which usually were near the bridge. The swimming hole, created by the long forgotten Camron sawmill, was a popular attraction.